At the beginning of January 2018, the weekly magazine Solidarność published our article titled “Together, let’s block U.S. Bills S447 and HR1226.” This appeal was noticed by leading Polish columnists and thus a discussion about the U.S. Bill S447 was initiated in the Polish media. The Polish diaspora in the United States was the first to raise alarm about this problem and still actively defends Poles against the unlawful claims of the Israeli government and Jewish organizations to heirless property left behind after World War II by Polish citizens of the Jewish faith. In that article, we stressed that U.S. law is incompatible with the Polish constitution, and importantly, with international law, respected by the developed/Western world. First argument: The claims apply only to a select ethnic group of World War II victims (i.e. Jews), completely ignoring other groups (e.g. Poles, Roma, Russians, and others). It is widely known that the Second World War caused the largest loss of human life in the history of the world. During the six years of WWII, over 60 million people were killed, which accounted for around 3% of the total human population. Third argument: Municipal and religious property has already been returned. Since the mid-1990s, Jewish organizations have been urging Poland to enact re-privatization laws. Initially, they demanded the return of Jewish communal properties. In 1997, the Sejm passed a law on the return of communal properties, and as a result, the Polish-Jewish communities recovered its pre-war facilities. The process included a wide array of properties, and the formalities were reduced to a minimum (i.e. the process was ‘fast-tracked’). Fourth argument: The restitution of Jewish heirless properties is incompatible with international law. From the legal point of view of Polish and international law, Jewish claims to property without heirs are groundless. Specifically, there are provisions in the Polish Civil Code, i.e. art. 935, which clearly and explicitly states that the property of Polish citizens who do not have legal heirs becomes the property of the Polish state. This is not a peculiarity of Polish legislation; on the contrary, this is a legal norm in the civilized world. Fifth argument: Claiming multiple damages for the same loss is against the law and of common sense justice. Victims of the Holocaust already received appropriate compensation from the German government in 1952. The issue is discussed in detail in a book by Michael J. Bazyler and Roger P. Alford, entitled “Holocaust Restitution: Perspectives on the Litigation and Its Legacy” published in 2006. This book elucidates the history of property restitution and relations between Germany and the newly-created state of Israel. Here is an excerpt: “The German Chancellor Konrad Adenauer delivered an address in the Bundestag regarding the initiation of talks with the Israeli government on compensation for the crime of genocide against Jews: ‘Unimaginable crimes have been committed in the name of the German nation that oblige us to make moral and material compensation’ he declared in the Bundestag on September 27, 1951. “The text of Adenauer’s speech has been the subject of detailed negotiations between the emissaries of the Israeli state, the largest Jewish organizations in the USA, and the German federal government,” explains Hans Günter Hockerts, historian and author of the monumental work on German compensation for the victims of the Nazi regime. The negotiations on compensation for Holocaust victims began on March 21, 1952, on neutral ground in Wassenaar, Netherlands. In addition to representatives of the German Federal Republic and Israel, the active participants included representatives of the so-called “Conference of Jewish Claims against Germany”, which at that time consisted of 22 large organizations representing Jewish survivors scattered around the world, except those who settled in Israel after the war. The talks lasted for half a year. As a result, on September 10, 1952, Germany and Israel signed an agreement referred to as The Luxemburg Agreement, titled: THE REPARATIONS AGREEMENT BETWEEN ISRAEL AND THE FEDERAL REPUBLIC OF GERMANY on compensation for Jewish victims of the Nazi regime. The Federal Republic pledged to pay the State of Israel three billion DMs (Deutsche[German] Marks) in the form of supplies of goods, spread over 12 years. The Conference of Jewish Claims received 450 million DMs. According to provisions of this agreement, the German government was to pay compensation for property (also heirless property) located in all areas that were under German occupation during World War II. 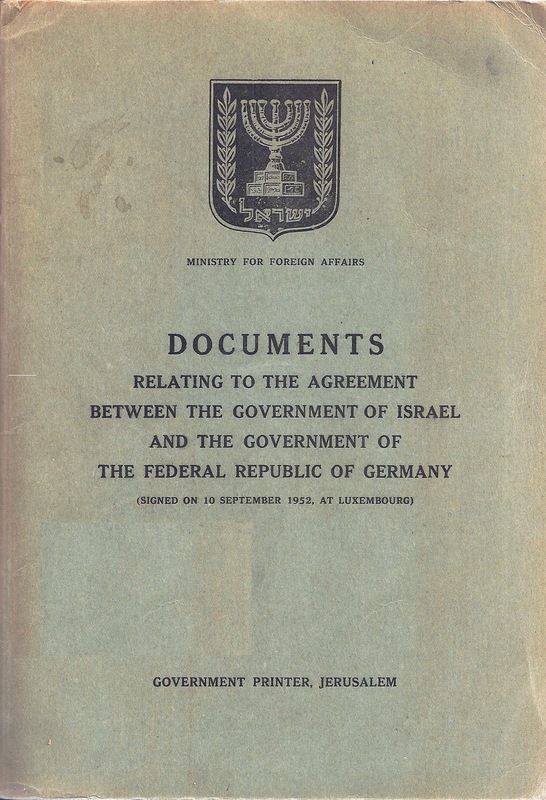 There is also much talk about the most recent agreement: ADENAUER-BEN GURION PACT — as a secret, informal arrangement, made by Konrad Adenauer and David Ben Gurion on March 14, 1960 in New York, at the Waldorf-Astoria hotel, according to which, in exchange for paying multi-million dollar sums to compensate Israel along with military and economic assistance, Germany received “unofficial” forgiveness from Israel for the murder of Jews during World War II. In other words, Germany’s good name was to be restored; meaning, in practical terms, a favorable attitude from Jewish opinion-makers and influencers. U.S. Secret Service agencies possess, therefore, documents that could change not only the course of history, but also the perception of different nations, including that of Poland. Maybe it is worthwhile to request them? It turns out that the U.S.-Polonia’s voice is important and should not be silenced. No one in Poland took seriously the U.S.-Polonia’s actions against S447 and no one supported the protests of Polonia activists in Washington D.C. We still do not have any expert base dealing with this problem, which could at least publish the two relevant international agreements – between Germany and Israel in 1952 (called the Luxembourg Agreement) and between the U.S. and Poland in 1960 – and publish a professional commentary. No Polish article on this subject has been published. There are many professional institutions in Poland that could address this matter. No one, however, has ever contacted any of the people in the U.S. who actively defended Poland against adopting U.S. Senate Act 447. We wanted to thank Prime Minister Morawiecki for his clear position regarding these unlawful and unjust claims. What is needed, however, is a plan of action, in cooperation between the Polish government and Polonia, in order to repeal the law. Time is short, and we can expect a repeat of anti-Polish speeches that took place in Warsaw during the last Middle East Conference. The argument about the intensification of the anti-Polish campaign before the elections in Israel is misleading. The challenge will last, even after the election. Especially if we constantly turn the other cheek. Let’s defend ourselves!!! We have many professional tools and experts. Let’s not squander this historic moment. We owe it not to ourselves but to our children and grandchildren. We are currently analyzing the text of the Luxembourg Agreement. We will inform you about our findings.